John Varvatos is a brand that occupies a unique place in the landscape of American design. It unites old world craftsmanship and refined tailoring with modern innovations in textiles. Internationally acclaimed and two time winner of the CFDA Menswear Designer of the Year award, Detroit native John Varvatos has mastered a look that embodies both world-class design value and the American affinity for rock’n’roll. Launched in 2000 with a collection of tailored clothing and sportswear, the brand now represents an entire lifestyle that includes belts, bags, footwear, eyewear, limited edition watches, luxury skincare and fragrances, as well as the younger, edgier John Varvatos Star USA collection and Converse by John Varvatos. Renowned for its fastidious attention to detail, fine craftsmanship and killer design, John Varvatos Eyewear is created for the man of style and substance. 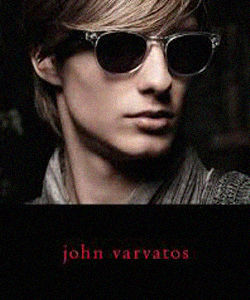 Visit the John Varvatos website.